The story goes that when Fry and Laurie were offered the roles of Jeeves and Wooster in a 23-episode ITV series back in 1990, they turned down the roles for fear that the public would never accept them as the classic characters. Of course, their worries were unfounded — since then they’ve arguably unseated Arthur Treacher and David Niven as the accepted image of the pair. For those who haven’t been exposed to the stories in any form, “Jeeves & Wooster” is at once very straightforward and exceedingly convoluted. Bertie Wooster is a rich young Edwardian gentleman who, while generally kind and well-meaning, tends to be lacking in the brains department. These traits combined also tend to get him mixed up with the craziest of ladies, contracting engagements the way most people get mosquito bites. Enter Jeeves, a dangerous intellect in the form of a gentleman’s gentleman, who chooses to devote his career to saving Wooster from himself. Said endeavors are never simple, though. A typical weekend in the Wooster household can involve multiple cases of mistaken identity, simultaneous engagements to two different women, missing or stolen items, and at least one pilfered constable’s helmet. In all such cases, Jeeves glides through the background, pulling strings here and there to bring things to a satisfactory conclusion. 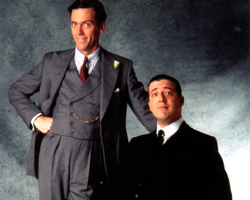 If you can’t tell by now, “Jeeves & Wooster” is not a logical series, nor was it ever. Even in its earliest iterations (the first appearance of the two in print was in 1917), the stories were more akin to grown-up fairy tales than any sort of real-world stories. Anything can happen in Wooster’s London, and the TV series preserves that lighthearted mood. Yes, the settings and costumes are historically accurate — and the lingo is pure snappy Wodehouse — but there is a necessary suspension of disbelief when it comes to the stories themselves. Fortunately, the scripts are so well-written, and the character portrayals so accessible, that it isn’t difficult to put aside any attempts at literary analysis in favor of good old-fashioned fun. Naturally, the majority of the series’s quality depends upon Fry and Laurie’s portrayals of the title characters, and they are truly in their element. Laurie pre-“House” was known for playing goofier roles on British television, and here he pulls faces and plays the stereotypical “Sloane ranger” while still coming across as lovable and sympathetic. (I believe the TV Tropes term is “woobie.”) And Fry is magic: Jeeves was always written as though it were impossible he could truly exist, but Fry blends that cool feudal spirit perfectly with an underlying superiority that borders on disconcerting. Machiavellian? Possibly a bit, but beautifully so. Die-hard fans of the stories will notice that some liberties are taken. One-shot characters are occasionally replaced with more familiar faces, and on occasion short stories are combined into one episode or longer novels have their multiple plots divided out between two episodes. There’s also a faint trace of serialization that was not as present in the original stories, but not so much that you can’t watch the series out of order if you so desire. Sadly, as the series goes on into its fourth season, it does suffer a bit. In places, it tends to drift from charming silliness into embarrassing goofiness, losing that tiny trace of restraint earlier seasons had. No, it doesn’t get bad or jump the shark, but there is definitely a jolting difference in style once you get closer to the end. Fortunately, despite what they’re given, the majority of the cast holds up well and keeps the show from becoming a parody of itself. This is a show that is truly watchable anywhen, anywhere, with anyone. There’s nothing violent or shocking about it (the worst it gets is Bertie saying “Dash it!” and offending some dear old ladies), it never gets dark or disturbing, and while the plot can get more convoluted than a Shyamalan flick at times, by the end of each episode everyone lives happily ever after. Or, at the very least, Jeeves lives happily ever after. The complete series of “Jeeves & Wooster” is available on DVD in a lovely little thinpak, perfect for fans who’d like to see the early work of TV’s sexiest doctor … good Lord, talk about an image change. Thanks for reminding us of that wonderful show. Your observations were spot-on. I also found that the show suffered in the later seasons. I think it started to go downhill after Jeeves and Wooster were lost at sea while attempting to return from NYC. For a show full of gentle unbelievability, it pushed the bounds a bit too much for me. That was actually the exact spot I was thinking of. Nice to see I'm not the only one. The first two seasons were, in my mind, the best, and when I need something to put on TV to make myself feel better, it's invariably one of those ones.